My canning storage has it's own inventory list. It is a fine line, people, I am telling you now, it's a fine line. Since I have done a ton of canning this year, I feel as though I am in a unique position to speak about this very important issue. Because you can can a ton of food and amass something that looks like doomsday prepping, but you MUST use it in order to call it useful. 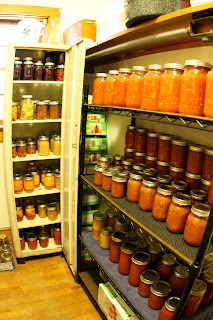 One of the biggest problems is that people will preserve (either canning or freezing, and I just happen to do both) but then they haven't got a clue as to what is really in their freezer or storage room. SO, they don't use it... they instead keep buying items that they don't actually need. I don't want to turn into a hoarder. I have seen the show, and it looks just awful. An otherwise well-meaning collection of food doesn't get eaten in a timely manner and the next thing you know, you've got 127 cats and they've eaten holes in your walls and some died in there. It's scary. This is a great reason to stay organized, if you ask me. To these ends, I had to take an inventory of my freezer. Because it had been far too long. And because I fear dead cats in my walls. I happen to have a stand alone freezer, which I find eternally useful. It was a gift from my dad for my birthday last year. Yep, I am just the sort of person who asks for freezers for my birthday. It's how I roll. While my freezer may be a little smaller than some, I find it is mighty. 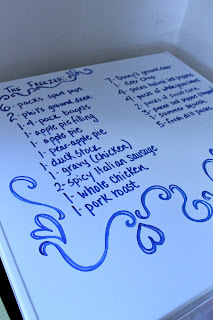 It also has a dry-erase feature that I find to be a great helper in keeping track of everything in the freezer! I know exactly how much I have and I can adjust as I go. That is, if I keep on it. So I made a list of all the stuff in my freezer by carefully unloading it, bit by bit. Obviously, adding little designs that include hearts will make your freezer exponentially cooler. So no skipping on that step! Alright, so tell me: what do you need to get to this fall??? 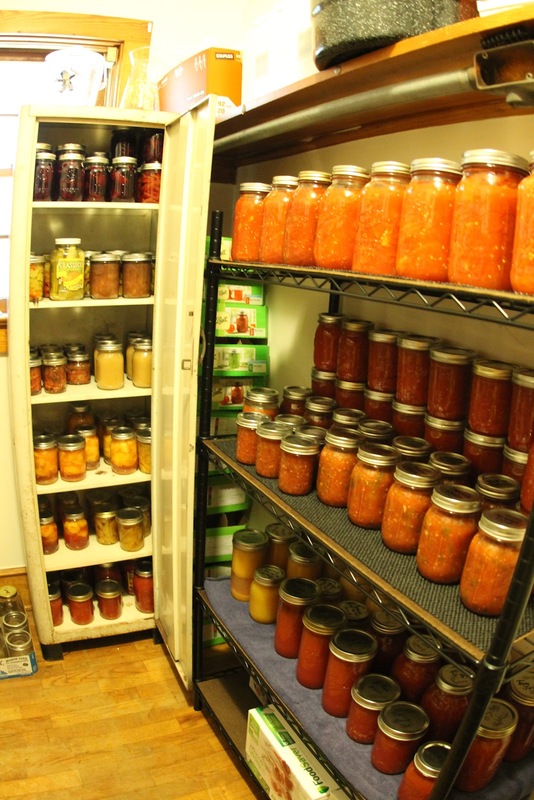 Do you know what is in your freezer and canning storage pantry? 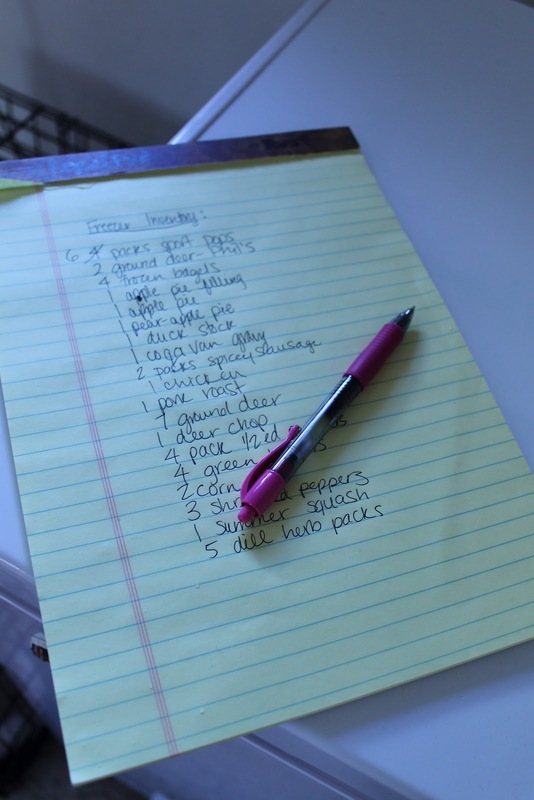 Are you relying solely on your memory for your freezer inventory or do you write it down? Leave me some feedback on how you are walking the line! Hi from an apartment dweller with no room for a deep freeze! You are absolutely right that fall is a good time to organize. It's a shame to carefully stock up then have to eventually pitch half of it because the food was forgotten. Haha. Liz, I agree! Small spaces can be challenging for storage, but with some careful planning you can really maximize on it. Knowing is, as they say, half the battle! The first year I had a large garden and started preserving the foods I grew, I had to resist the temptation to hoard what I had worked so hard to grow. I was so excited to have grown enough of our favorite veggies to feed my family for a year. Now that I've been growing for several years, I know that the next garden is right around the corner, so I don't hesitate to open the jars or the freezer. My only problem is a lack of space. We have a small room upstairs that I can transform from an office to a pantry once the girls are out on their own (in the next couple of years) but for now...I just stack and store where I can. Glad you could relate Betsy! A lot of people have storage issues because of small spaces. One solution (because as you likely know, with the cans you don't want them in sunlight) is to to a book shelf with the cans and then install curtains on the shelves to cover the cans. I love the look of the cans, though, so I like to see mine! Haha. As far as the gardening goes, you are one step above me. I wish I had a huge garden to brag about--but I get my stuff from a farmer. Next season, though, I am helping a friend (who has a monster garden) and so I am hoping to learn a lot more and be one step closer to where you are! Thanks for reading, and if you have any other small space tips for readers, please share them!